PeeClenz - The One That Works! When the urine dries, the urea is broken down by the bacteria. This is what makes it smell like ammonia. As it decomposes further, the odour gets worse. This is where our artificial grass cleaner PeeClenz comes in handy! Common household cleaners or home-made mixtures simply do not contain the required ingredients to remove all the components of dog and cat urine, whereas professional artificial grass cleaners do. Vinegar and baking soda work to neutralize the odour temporarily but pet urine is composed of things that REQUIRE enzymes to break down the chemical bonds, namely uric acid and its salts which are not water soluble and bond tightly to whatever surface it touches. This is why it is absolutely essential to use an agent that can break down the uric acid. Soap, vinegar, baking soda, ammonia, chlorine, and hydrogen peroxide (to name the most common agents) simply are not chemically capable of breaking down the uric acid in pet pee. 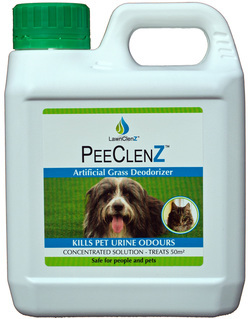 These cleaners and deodorizers only temporarily make the smell go away and appear to work because they do clean up the other components of the pet urine. But when exposed to humidity, the uric acid salts cause the uric acid crystals to reform, releasing the smell all over again. ​The only thing that will break down the uric acid and permanently remove the smell is an enzyme artificial grass cleaner formulated specifically for artificial lawns. This is why our team of bio-chemists and artificial lawn experts have created PeeClenz. The unique blend of enzymes in our artificial grass cleaner break down uric acid into carbon dioxide and ammonia, both gasses that then easily evaporate in the garden, leaving your lawn fresh as a daisy. Is The Smell Of Dog Urine Dangerous? Dog urine doesn't just smell bad. In high concentrations, it can pose health hazards for your family. In addition to the bacteria present in the urine, one of the primary constituents of the liquid is ammonia, which can be dangerous to inhale. Ammonia fumes are irritating to the nose, throat and lungs. When ammonia contacts mucous membranes like the eyes, nose or mouth, it bonds with the water, creating Ammonium Hydroxide. The caustic action of this compound creates respiratory distress that can in the worst cases cause respiratory failure. The odour of dog urine may exacerbate asthma for some people. Additionally, while animal hair and fur often cause pet-related allergies in people, droplets of saliva or urine-associated proteins may also trigger allergic reactions. Because of this, allergy sufferers may still experience problems from short-haired dogs.